Wingnut Films/Universal Pictures - 106, 110 or 123 min. Cast: Michael J. Fox, Trini Alvarado, Peter Dobson, John Astin, Dee Wallacestone, Jeffrey Combs, Jake Busey, Chi McBride. Writers: Peter Jackson, Fran Walsh; Production Design: Grant Major; Directors of Photography: Alun Bollinger, John Blick; Editor: Jamie Selkirk; Music: Danny Elfman; Executive Producer: Robert Zemekis; Director: Peter Jackson. In the quiet town of Fairwater, Frank Bannister makes a living by ridding haunted houses of their unwelcome "guest". But, as it happens, he is in collusion with the very ghosts he promises to evict. It works well until he happens upon a case which involves a diabolical spirit on a murderous rampage - and the town believes Frank is behind it. Filmed in Lyttelton, standing in as Fairwater along with a few Wellington area shots, this film was not highly received at the U.S. boxoffice, although it is very well directed with excellent special effects. The mix of humour with horror might have been the reason. A very entertaining film that is definately recommended. There is both a regular TV version, as well as a widescreen version. A R4 DVD is available in NZ amd AU for about $20, an R2 from the UK for about 5# and an R1 from North America for about $10us. Used VHS can be found for under $5us(NTSC) and 3#(PAL). In December 2005, Universal released an R1 NTSC double-sided, single disc "Director's Cut" which sells for about $20us; a 4-disc R 2, PAL German release selling about 27eur; a 3-disc R 4 PAL Australian/NZ release for$35au/$40nz and a 3-disc R2 PAL UK release selling for about 20#. It is 23min. longer than what was previously available on DVD and audio is dolby surround 5.1, dolby surround 2.0 and, except for the R1 release, DTS 5.1. It is presented in 2.35:1 anamorphic widescreen format. The confusion over what exactly is contained has come from the info going around about the package being one-disc, two-disc, three-disc or four. The R1 North American release is a single "flipper" disc that has the feature, with a 2 minute intro by Jackson, on one side, along with an optional audio commentary by Jackson. The other side contains a 270+ minute "Making of" documentary that includes: interviews with Michael J. 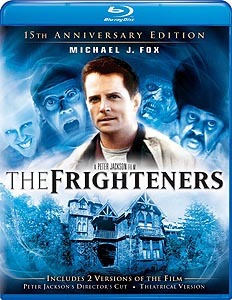 Fox, Trini Alvarado, Dee Wallace Stone, Jake Busey, Chi McBride, John Astin and Jim Fyfe; a section (Ghost Stories) where Jackson and Fyfe share their personal close encounters with ghosts; bloopers and "lost footage" is included, as is a piece with Peter describing script development; a cast rehearsal; an introduction to WETA; a close-up look at miniature use; motion control and bluescreen effects; details on how they constructed wallpaperman, portraitman, slimeface, blobman, worm, the reaper; there is a 24 minute section on the music, with Danny Elfman and more. The R1 version also offers subtitles in English, Spanish or French. With the AU/NZ and German versions, the 270+ minute documentary is split between discs 2 and 3. The German version is the same as the other R2s, except that there is a fourth disc in the package that contains the original 105 min. theatrical version feature in anamorphic 2.35:1 with original English plus French or German 5.1 surround dubbed options. The subtitle options on the R2,4,5 Director's Cut offerings are: German, English, French, Spanish, Italian, Arabic, Bulgarian, Croatian, Danish, Dutch, Finnish, Hebrew, Islandic, Norwegian, Swedish, Romanian, Slovenian, Turkish, Portuguese & Greek. The R2,4,5 optional director's cut commentary has subtitle options of: English, Dutch, French, German, Italian, Portuguese, Spanish, Danish, Finnish, Norwegian & Swedish. Special note for North American R1 only users; although the 4-disc German version says it is R0, in fact it is R2 and therefore you will run into the usual problem when trying to play it on an R1 only player. As of July 2009, an HD - NTSC version is selling for about $10us, and a PAL version was available in New Zealand for $40nz, but it may no longer be available except via ebay. An all-region Blu-ray version became available from U.S. and Canadian sources starting 13 September 2011. It contains both the theatrical cut(110min) and the Director's Cut (123min). The film is presented 1080p with the choice of an English DTS-HD Master 5.1 soundtrack, a French DTS Surround 5.1 soundtrack or an English 2.0 surround track for most of the extras. There are subtitles available for English, French or Spanish. The extras are the same ones that are found with the 10th anniversary DVD director's cut and they presented 480i. As of September 2017, this is selling for under $10us. A Region B version was released in the UK, Australia and New Zealand starting October 2011. The extras are the same that are included with the All Regions US one. 1996 - Catalonian International Film Festival - Best Special Effects.